Two Alabama fisherman on the Warrior River were surprised by a kitten swimming toward their boat. After extracting the soggy and very happy kitten from the water, they were shocked to see another kitten jump into the water and swim quite a distance to the boat as well. We hope these two heroes welcome these little survivors into their homes and hearts. Definitely a bigger commitment than the typical catch, but totally worth it. 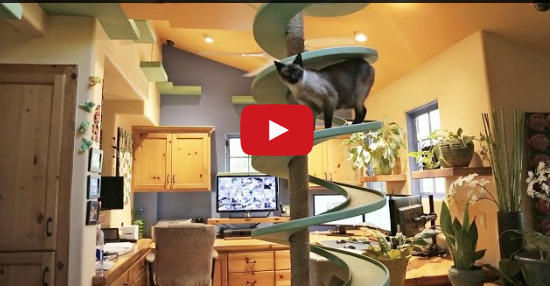 To keep his 15 rescue cats happy and busy, home builder Peter Cohen has constructed an elaborate playland of catwalks, tunnels, platforms, and perches throughout his California home. This is one fun house you’ve got to see to believe — and your heart will explode with love and joy. Be sure to check out the cat house built by Greg Krueger as well! There’s just nothing as cute as animal buddies! 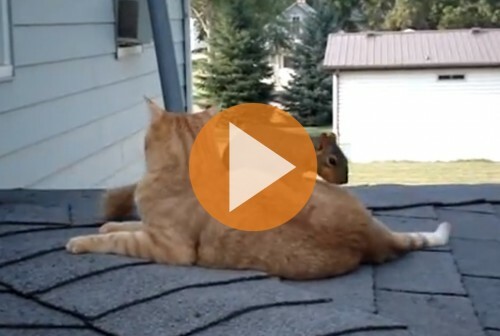 This pair is a former hand-raised squirrel who was successfully reintroduced to the wild, but he comes back for play time with his old buddy, the family cat. Can you say, “awwwwww”?